I’m a big fan of tote bags – I own so many different shapes and sizes that I’ll never be able to use them all. But at least I have options! 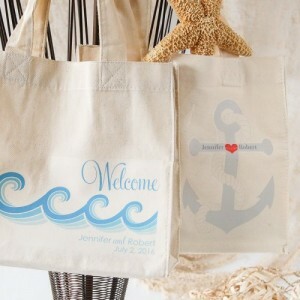 Which brings me to today’s fun wedding favor – these adorable and very practical personalized cotton tote bags. These bags are the ideal favor for your guests if you’re hosting a destination wedding. Not only can you choose from more than a dozen designs (I picked the beach theme because…the beach), but you also add your names and wedding date to the bag. Your guests will love these tote bags – especially if you fill the bags with fun items including bottled water, mints, snack mix, sunscreen, hand sanitizer, or any other fun “minis” that your guests might need or want while enjoying your destination wedding. You could make sure the bags are placed in each guest’s hotel room when they arrive – a perfect “welcome” and “thank you” gift from the new couple. You can find these personalized cotton tote bags here.